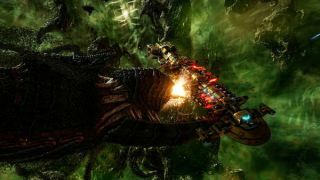 Space RTS Battlefleet Gothic: Armada 2 lets you roleplay the hungriest fleet in the galaxy in one of three singleplayer campaigns. The new campaign structure behaves like a pared-down 4X campaign. You move your ships between sectors and develop planets to create resources, which you then spend on ships. In the Tyranids' case the currency is biomass, and they get it by occupying a sector. It takes only three turns for them to kill and liquify everything in the vicinity. The Imperium sends battleships to try and stop you, triggering real-time battles. Like the first game, engagements take place on a 2D plane (no Homeworld-style multi-directional laser parties here). You tend to have a few large vessels and a handful of escorts. The emphasis is on micromanaging each ship’s subsystems. Normal ships have special orders that let them boost speed, lock on to enemies, send out bombing runs, scan the area, and board enemy vessels. Tyranid ships aren’t normal. It feels more like corralling a shoal of squid that wants to run into the nearest enemy vessel and start chewing. The ships are surrounded by swarms of smaller Tyranids that buzz around any enemies close enough. Some of them can spit out spore bombs that serve as ranged attacks, but more than anything they want to use their terrifying two-second speed boosts to get close, and then start boarding with ravenous hordes of genestealer troops. It’s a chaotic way to play, and very bad news for other factions that need to get close to do damage (RIP Orks). You can do particularly gross things to vessels within a few ship lengths, like extend a sucker tentacle that latches onto the enemy and deals damage over time—it’s better not to think about how exactly that works. Smaller vessels can self destruct, leaving behind a damaging cloud of spores. The hardest thing about playing as the Tyranids, apart from stopping your ships from crashing into each other as they charge in, is getting them close enough in the first place. They start an encounter stealthed, so there is scope for hiding them in asteroid fields—their adaptive trait means they don’t take damage from detritus like other ships do. You have to be opportunistic and a touch lucky to pull off the perfect Tyranid ambush, but it’s a fun way to play them. The last thing you want is a Chaos fleet popping your squids with artillery as you try to rush them head-first. The campaigns look like sandboxes, but there’s plenty of story packed into between-mission chats and the occasional cutscene. The prologue mission is particularly heavy on spectacle, and overall the game does a great job of evoking the scale and pomp of the setting within the confines of the battlefields. In addition to the Tyranid campaign, you can also play as the Imperium and the Necrons (near-immortal regenerating robots). I haven’t had chance to experiment with the Necrons yet, but the Imperial ships behave much as they did in the first game. The UI makes the game look a lot more complicated than it really is. Every ship has a sensible autopilot mode that does a lot of the manoeuvring. Most of the game is about picking targets and focusing them down with the right weapons. It gets complicated when there are a lot of ships involved, and certain matchups can be very challenging. I was thankful for the pause button at points. When space squids clash with Imperial floating cathedrals, things get hectic. In a galaxy of dodgy Warhammer 40,000 games, the Battlefleet games really stand out. There are elements of the tabletop game that I’d like to see represented—galactic phenomena, gravity wells, and so on—but it’s a solid space RTS at a time when those are in short supply. We gave the first game an 80, and I wonder if Armada 2 can do even better when it launches on January 24.